Barcelona's Lionel Messi has received a timely boost ahead of the Champions League final from Argentina legend Diego Maradona, who claims the young star is the first player to be as good as himself. Although many talented players have been labelled the 'new Maradona' through the years none have lived up the hype, but the 1986 World Cup winner believes Messi is the real deal. 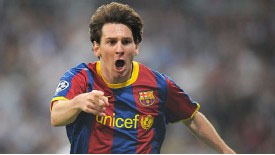 Argentina international Messi, 23, is widely-regarded as the best player in the world and is one of the main reasons why Barcelona go into Saturday's Champions League final as favourites to beat Manchester United. "I've heard many times over the years that there is a 'new Maradona'," El Diego told The Sun. "With Messi, though, I believe the player is equal to the hype. He is an incredible talent and someone who has the unique ability to do things with a ball you don't expect. "That's what makes him special. All great players can play the game and do things which make everyone open their eyes with admiration. But only the truly special can make you gasp as you didn't think what they did was even possible. That is what Messi does. "Yes he's capable of magic. But he is also a worker for the team." But despite his plaudits for Messi, Maradona feels Manchester United's attack of Wayne Rooney and Javier Hernandez, whose performances this season have been followed in South America, can cause plenty of trouble for Barcelona's defence. "For me, the United players who are most important are the strikers," said Maradona. "I watched Hernandez play in Mexico and you could see he was a real talent who could score goals at the best level.